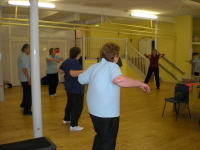 Exercises classes are held in Faversham twice a week. 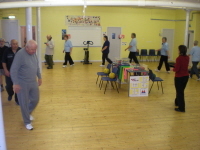 The exercises, which last an hour (plus a few minutes' changing time), take place at the Baptist Church Hall, St. Mary's Road, Faversham on Monday at 10.45 am and Thursdays at 11.15 am, using specially purchased equipment. New participants are very welcome. You can just pop in on Mondays or Thursday to see what we do. You may be recommended by your G.P. or Health Professional or by word of mouth. All applicants are individually assessed by one of the instructors and you can attend either class, or both. To find out more:- contact Erica on 01795 522413 or 0781 2854339 or email erica.wilcox2016@gmail.com and we will call you back..
As from Jan 2014 classes will cost £4.00 a session. Classes began in 2002. They are organised by Faversham Activity for Health, a registered charity, recognised by the NHS Exercise Referral scheme. We also put on social events such as a garden party and a Christmas get-together. So participating is not only good for you, but also fun!